My wife loves spinach. So do I. Both of us love this simple yet delicious curry. I had surfed the net and my collection of cookbooks for a suitable recipe but found most either pale/dark colored or too greasy or just too convoluted. This recipe is my own concoction out of the many websites and books I referred to before embarking on my own exploration. I might not be a trained chef but now I can call myself an experienced adaptor of published recipes. Put the spinach in boiling water for approximately 12-15 minutes (do not cover). Drain the spinach and reserve the water. Put the spinach in cold water and let it cool down completely. Heat the oil in a pressure cooker. Add the cinnamon sticks, bay leaves and green cardamom and cook until the begin to crackle. Now add onions and fry until they turn transparent. Mix the red chilly powder, coriander powder, turmeric and salt in 3-4 tbsp water to make a fine paste. Add this paste to the pressure cooker and sauté for 3-4 minutes. Now add the chopped tomatoes and cook until the tomatoes are mashed. Add the chicken pieces and garma masala powder. Cook on high heat until the chicken pieces change color, their juices are sealed and the masala envelopes the pieces. This may take 3-5 minutes. Add ¼ cup (or less) of the reserved spinach water. (If you have drained the spinach water, just use plain water). Bring to a boil. Cover the pressure cooker, reduce flame to simmer. Let the chicken simmer under pressure for 8-10 minutes. Turn off the flame and wait until the pressure is released from the cooker. Open the lid of the pressure cooker and cook the chicken curry for another 5 minutes or until the gravy is reduced considerably. Now add the chopped or pureed spinach to the curry. Let it cook for approximately 5-7 minutes. Adjust the seasoning. Sprinkle kasuri methi and let it cook for another minute. Heat some oil in a pan. Add the chopped garlic and fry until it turns golden brown. Add the red chillies and let them fry for 2 minutes. 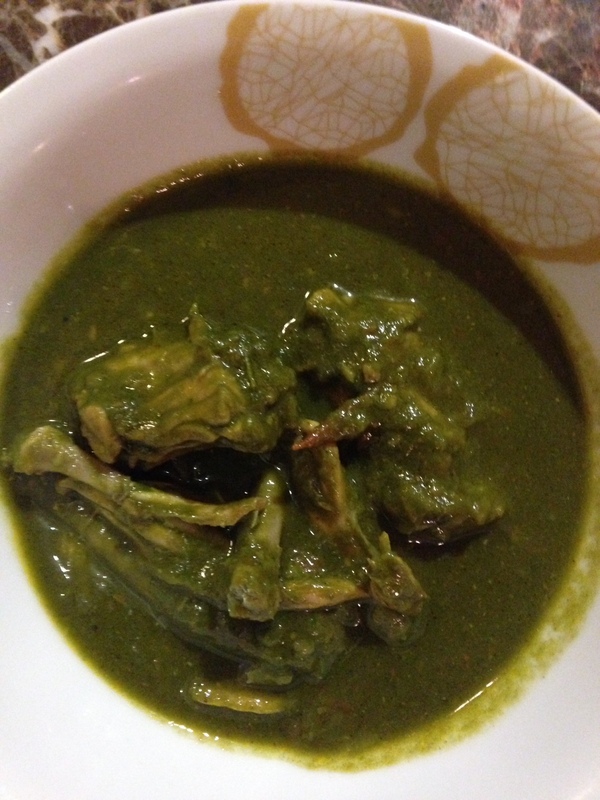 Pour the tempering over the Palak Chicken gravy. Mix and cook for another minute. This recipe is simple, nutritious, satisfying and vibrant. My daughters who are usually averse to spinach now demand that I make Palak Chicken every time I am asked to cook a chicken dish. Add more red chilly powder and coriander powder if you like your curry spicy. I prefer my curry to be subtle and particularly light if it is being cooked for a weekday dinner. Its been a long time since I shared recipes on the blog. There are many new recipes that I promise to share soon!